The Chiang Mai Inter Tae-kwon-do Club held its first Tae-kwon-do Tournament Championship of the year in which the trophy of Sudarat Keyurapan, the minister of Public Health and the shield of Dr. Pansak Wongkasikorn, director of Chiangmai International Business College went to the winners. The boys square off in a male Tae-kwon-do bout. The results of the tournament saw the boy’s gold medal winner being Purinut Suttiwiset from the Sai Tharn Tip team, and the girl’s gold medal going to Chalita Nongthamaraj from Black Belt team. The gold medal for young women went to Omdao Udomapla from Tae-kwon-do Kid, and the overall gold medal winner was Nurudee Jiyaworanand from Charoen Tham team. Two young women do battle in the female Tae-kwon-do competition. The Minister of Public Health trophy was won by Tae-kwon-do competitor Thanatip Muenpoh from Khanitta Gym. 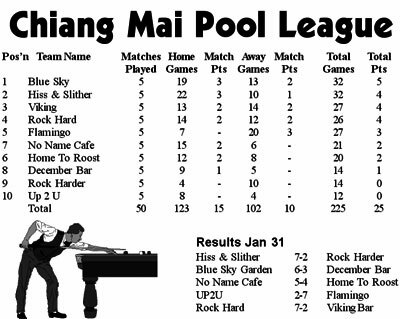 The best female team was the Chiang Mai Inter team and the best male team was the Black Belt team. 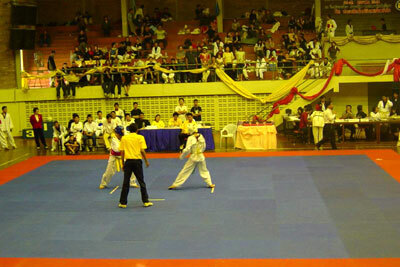 The tournament was run from January 25-26 at gymnasium 3, Chiang Mai University. Last Saturday a very exciting junior cricket tournament took place at the Prince Royal College in Chiang Mai. Six schools took part and really showed the audience what cricket was all about. Junior cricketers build up their wicket experience at Prince Royal College in Chiang Mai. In one of the finals, Prince Royal College beat Sahadong 2, and the winning match took place between Rong Or School and Montford College. Rong Or School came out as the overall winner, but both of the final matches were very close and full of life. Further news: a full cricket match will be held on Sunday, February 16 between the Gymkhana Club and Motorola. Approximate time will be 11:00 a.m. More information coming soon. 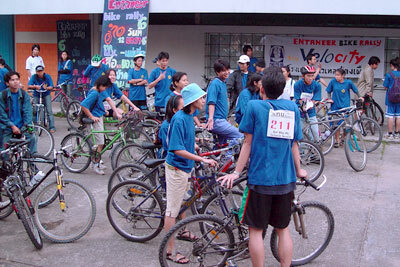 The Entaneer Bicycle Rally is held annually one day after Children’s Day at the Faculty of Engineering, Chiang Mai University. This year the rally (the 6th to be run) ran from the local campus to the Mae Hia campus, and was on January 12. This event is held to encourage students and families to use bicycles for daily transport. This year, the project wished to promote bicycle tourism in the beautiful natural environment of Chiang Mai and it is hoped that students and staff involved in this project gained experience in teamwork. 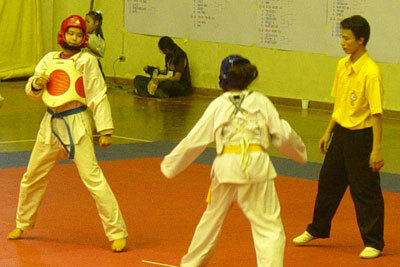 The competition was divided into 4 age groups, under 15 year-old, 16-28 years, more than 29 years old and families. All competitors had to complete 3 sections in the rally. The winners of all categories won cash prizes, trophies and certificates from the Faculty of Engineering, Chiang Mai University. CH3, the oldest hash club (males) in Chiang Mai is picked up from the “ONON” pub (Moon Mueng Soi 1) at 16.00 once every 2 weeks (hence: on 18-11, 2-12, 16-12, 30-12 and 13 01 2003). Pick up can be arranged from Fish and Chips shop as well. The hares had us drive up Samoeng Road past the football field and told us to park smack dab in the middle of a village. Not good. The village idiot factor is bound to skyrocket. Anyway, after cars were lined up and down the road for almost a kilometer, we were sent off on the run. The first check was about twenty meters from the start. The first checkback was visible from the carpark, so no one checked left. Head Hacker went right, which was wrong, and Superman led the pack into the rice fields and the first circle check of the run. After paper was found, it led us through a river and onto the other bank. It soon became obvious we were skirting around the large rice field, and slowbies tried to shortcut, but they were stopped by the raging 6 inch deep river. After circumnavigating the rice paddies, and crossing two more streams, the pack found themselves looking up a stairway to heaven, roughly hewn into the side of a huge mountain. Wombat and Foot Long fought each other to be the first up, clawing and gouging at each other’s eyes. It was like watching a moving cat fight. After trudging our way up about half of the mountain, a fresh and cool Superman pops out from the left, coming from God knows where, feigning “Checkback!” where there was no check. Just where did he come from? Well, he had no problem clambering up the rest of the hill, leaving HP, Kwazi Moto and Head Hacker in the dust. By the time we finally got to the top, breathing was hard and oxygen levels were down. It was such a tough hill, that even the Buddha was lying down in the jedi which greeted us. No time to dally though, because the paper trail led further UP, if that was at all possible. The running became easier as the slope became more reasonable. Pamela zoomed past me at that point, almost as if he could smell the beer that awaited us. It was a bit premature, though, because the trail down the mountain took us the long way around. Fifty minutes into the run, we come across the promised Wimp / Rambo Split. After fifty minutes most of us were already knackered, so it was a real no-brainer of a decision: Wimps, here I come. It was a very pretty trail from this point on, and it brought us down to the “NO NO” (inverted “ON ON”) pointing us right onto the main Samoeng Road again. The GM rightly splashed the hares Molester and Bone Hur for a too-flat, too-short, too-easy, too-much-paper run. Major BS led the slugs into the circle for their obligatory punishment. Bone Hur was noticed way too many times appearing out of nowhere on the run, telling people “go right”, “go left”, “cross the river”, etc. etc. You know most hares just lay paper. This team sent the co-hare out to personally guide us. Molester came in again for a near champion splash: setting a run and joining the circle when his wife is in labor in hospital. At least he has his priorities right. Seven visitors and virgins came forth for a welcome to Chiang Mai. There was a whole gaggle of returnees, too, like Mud Wrestler, Hot Lips, Prairie Fire, Singh Gold and others. Then Kiwi B and Burrito B were spotted for being returnees and not joining the others. Superman was splashed for going into someone’s outhouse for an urgent dump, and surprising some poor woman taking a shower. Prairie Fire and Rich were caught throwing their glasses on the ground and duly awarded. Head Hacker and DC led almost the entire committee onto the ice for forgetting their 100 Run Mugs. Then Superman was brought in for not having his “weasel” (I think she meant whistle, but I like weasel better). Wombat and Foot Long were acknowledged F.R.B’s. Head Hacker, DC and Dirty Rotten Filthy Pervert were brought in for wheezing up that mountain. (Who didn’t wheeze?). John and DC were brought in for using canes to get up the hill. DC won the chance for a one-way trip to Burma, and Rocks Off was the designated Cheap B. Kiwi B was accused of being a pedal-file. Stumbling D, CQ and Superman were caught short cutting on the run. Major B was the only one proudly wearing his 200-Run gong. Superman’s [email protected]#* was taken away and given to Wombat for racing with Foot Long. Square Rooter and Miss Piggy were given thank you splashes for doing the previous run write ups. Female Wings were awarded to Bone Collector and the Male Wings were given to Foot Long. There are secrets in this box fight writing business that are to be kept under lock and key. Should those secrets ever see the light of day a lot of typing hacks would be in serious trouble. Serious trouble in that they would have to find a sport to write about where they actually had some knowledge. In short, most boxing writers don’t know squat about boxing. They wouldn’t know a good fighter from an average one unless someone tells them. That definition of course excludes “Moi”. In short they are clueless. If any better example is needed than the much heralded, with no foundation, rating of the “Best Fighter Pound-For-Pound.” This is nothing more than an excuse to attempt to convince someone that the writer actually knows something. Can you imagine two punters sitting down for a cold one and discussing the “Pound for Pound” best dancer at one of the many Oases that dot the landscape? Bad example but you get the idea. Writers struggling for someone to write about then found Sugar Shane Mosley (38-0). “He has everything. He beat Oscar DeLaHoya”. Along comes Vernon Forrest (33-0). Two losses later Shane Mosley is fighting in an arena that seats 5,000 at a fading casino on the Las Vegas Strip. Though, to be accurate, the drums will beat with Mosley’s win so the September fight with Oscar will seem like something special. It ain’t and won’t be. Now Vernon Forrest at 38-0 becomes Vernon “The Viper” Forrest. The new “Pound-for-Pound” best fighter in the world. He’s got it all. A new six-year contract with cable TV giant HBO, the unified title and a spotless record. Whoops. Two Saturday nights ago he dances into a ring in California, singing and happy to fight Nicaraguaian Ricardo Mayorga (24-3-1). Mayorga’s claim to fame had been that he won a minor title by knocking out Andrew “Six Heads” Lewis, a fighter headed downhill faster than Hermann Maier, aka the Hermanater. Three rounds later the Pound for Pound Champion is out colder than a punter without baht to his name. Bye Bye Vernon. Bye Bye 6 year contract and bye bye titles. Pound for pound this! One reporter actually asked Shane Mosley if he would like to fight Mayorga. “You could fight the guy that beat you.” With a straight face his paid liar said, “We’ve had no thought of that.” I would hope not. You can’t beat the guy so you damn sure can’t beat the guy that beat the guy. If there was ever a time for a couple of Thai fighters at 130 to step up to the plate and take their hacks, this is that time. If timing is everything, then WBC Champ S. Singmanassuk (42-1) and WBA #1 Yodsanan Nanthachai 3K (39-2) have got to make their move on the international stage now. This advice comes after Joel Casamayor (29-1) got a second life when he was clearly taken to the woodshed by Nate Campbell. Casamayor did a Houdini and got a 98-92, 97-93, 96-94 win that should have the judges doing hard time with no parole. Casamayor’s there to be had. 3K-Battery didn’t hurt his cause with a 2 round KO of Tirso Albia last Thursday on Channel 7. During the same telecast ex-WBA Champ Yoddamrong (Sithyodthong) Singwangcha (32-1-1) took Dondon Lapuz out in 4. Former world champion Paul Pender (40-6-2) passed away early this year. That’s a name that most of you “whipper snappers” in Chang Mai probably don’t remember. Of course if you’re a young “whipper snapper” you probably aren’t reading this column. You’re out snapping your whipper. Pender was a throwback to days gone past. He retired when he wanted to and lived the quiet life in his native New England. His last five fights were against Sugar Ray Robinson (173-19-6), Carmen Basillio (56-16-7) who retired after the fight and three against Englishman Terry Downs (35-9-0). His trio of fights against Downs were classic. Pender took the first in Boston (15 round split decision), lost in London (10th round TKO) and won the rubber match in Boston via a 15 round decision. He retired after that fight. Terry Downs? He had a great career beating Don Fulmer, Phil Moyer and Sugar Ray Robinson. Want to know more about Downs? Ask Thailand’s premier swim coach and former fighter, Canadian Tony; he’s Downs’ cousin. How about them apples?